For Christmas this year, I happily reprise a strip we talked about earlier this year (August 8, 2012), DOOLEY’S WORLD (1972-78) by Roger Bradfield. At Christmas time, the Dooley cast would attempt a reading of Clement Clark Moore’s poem, “A Visit From St. Nicholas.” Usually, all would start out well, with Thelma the Rag Doll, Norman the Knight, Neville the Jack-In-The-Box, The Professor and Dooley himself starting off smartly, but Max the Mouse always forgetting his one word contribution. I asked Mr. Bradfield if he had any intention of some Christmas having Max actually recalling his part, but he said no—he thought Max would be destined to never come up with the right line in time. Poor little fellow! So to all a good night and a, um, a something…. 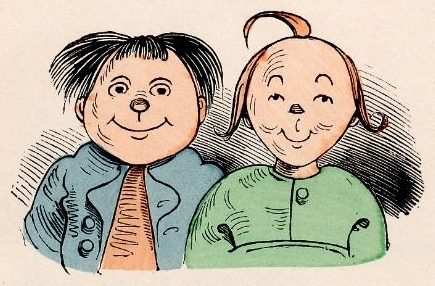 The Prototype KATZENJAMMER KIDS: Wilhelm Busch’s MAX UND MORITZ. MAX UND MORITZ are to this day, huge cultural figures in Germany and most of Europe. They still reprint Busch’s books in many languages, they name things after them, issue postage stamps, have stage shows, toys, in fact, they do all kinds of what we would call licensing, though they’re no longer “Owned” by anyone.